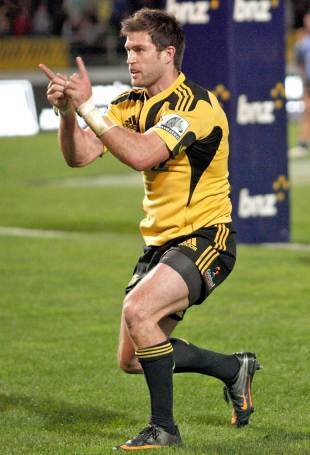 All Blacks winger Cory Jane will play for the Hurricanes again next season - if he opts to remain in New Zealand. The 28-year-old has reached an agreement with the Wellington-based franchise that will see him back in Hurricanes colours next season should he opt against a stint overseas. Jane, who has spent his entire Super Rugby career with Hurricanes, revealed earlier this year that he was considering an offer to move abroad and has since questioned his Hurricanes future further in the wake of the high-profile axing of fellow All Blacks international Ma'a Nonu. But it now looks as though he may well commit to coach Mark Hammett's quest to breathe new life into the team. "Cory is still considering his options for next year, but he has now signed a contract with us which states that if he plays Super Rugby next year it will be with the Hurricanes rather than any other franchise," Hurricanes chief executive James Te Puni said in a statement tonight that also confirmed the re-signing of loose forwards Serge Lilo and Jack Lam. Jane won the last of his 23 Test caps against Ireland in Dublin last year but is under pressure to retain his place in the squad after a disappointing Super Rugby campaign. He appeared alongside fellow All Blacks hopeful Piri Weepu, who is also set to re-sign with the Hurricanes, as Wellington defeated Canterbury 40-14 in an ITM Cup pre-season match in Petone.